A quality of earnings report is a routine step in the due diligenceDue DiligenceDue diligence is a process of verification, investigation, or audit of a potential deal or investment opportunity to confirm all facts, financial information, and to verify anything else that was brought up during an M&A deal or investment process. Due diligence is completed before a deal closes process for private acquisitions. Net incomeNet IncomeNet Income is a key line item, not only in the income statement, but in all three core financial statements. While it is arrived at through the income statement, the net profit is also used in both the balance sheet and the cash flow statement. 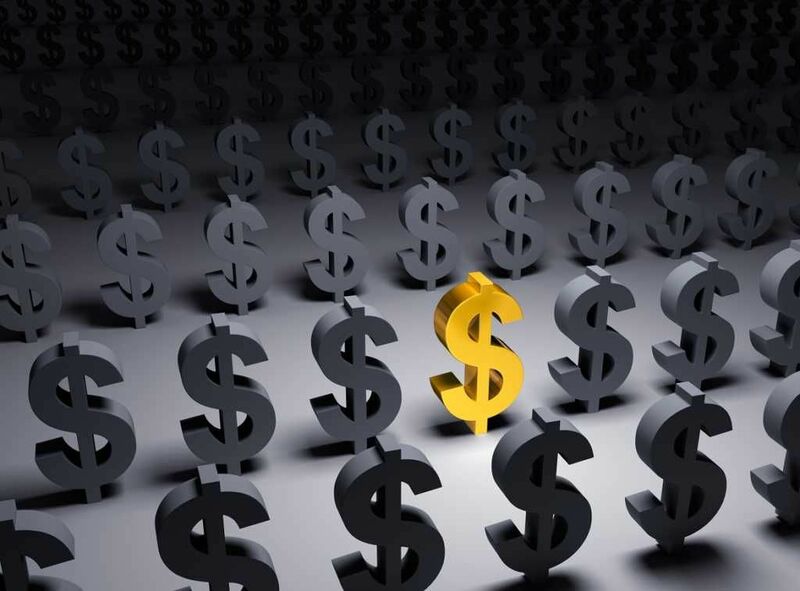 is not necessarily a 100% accurate indication of financial performance for a business. If a company reports large net income figures but negative operating cash flowCash Flow Statement​A Cash Flow Statement (officially called the Statement of Cash Flows) contains information on how much cash a company has generated and used during a given period. It contains 3 sections: cash from operations, cash from investing and cash from financing., for example, then it may not be as financially sound as it appears. A quality of earnings report assesses how a company accumulates its revenues – such as cash or non-cash, recurring or nonrecurring. There are many key details that are not outlined in a company’s income statements and a breakdown of cash sourcesCash SweepThe easiest way to understand a cash sweep and sweep accounts is to think of a cash sweep as any deliberately chosen and automated transfer ("sweeping") of a portion of a company's or an individual's cash flow to be used for a specific purpose - such as paying off debt or making an investment. is very important. Quite simply, if a company reports a positive net income but poor quality earnings, then acquiring the company may be a more risky investment than the company’s financial statements indicate. This assessment should affect whether or not an acquirer decides to pursue a private acquisition. The following is an example of an abridged version of a hypothetical due diligence quality of earnings review conducted when fictional company XYZ Capital Partners decides to acquire the privately heldPrivately Held CompanyA privately held company is a company’s whose shares are owned by individuals/corporations and that does not offer equity interests in the company to investors in the form of stock shares traded on a public stock exchange, nor is it owned by a government. A company in the "private sector" refers to non-government-owned ABC Co and partially acquire DEF Co (ABC’s sister company). The review is being completed by external auditors QRS LLP. 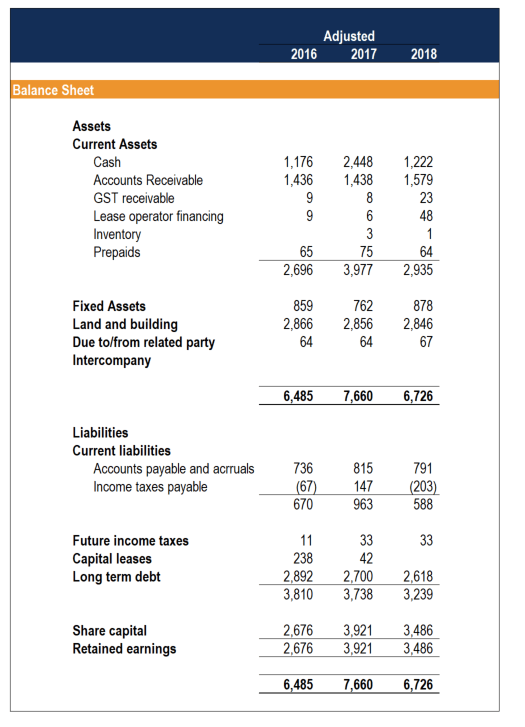 It is separated into 3 sections: (1) an executive summary, (2) income statement, and (3) balance sheet. 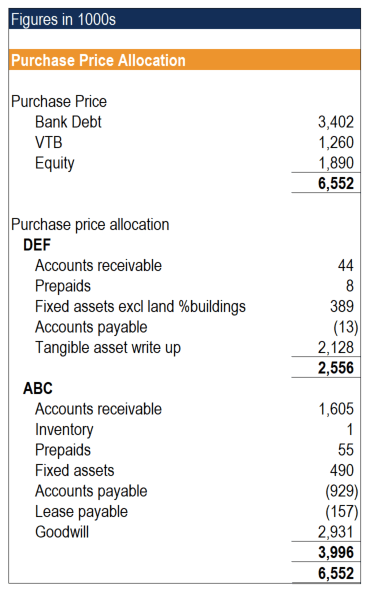 In this deal, XYZ will also purchase components of ABC’s sister company, DEF, in order to gain control of certain fixed assets pertinent to the acquisition. XYZ’s letter of intentLetter of Intent (LOI)Download CFI's Letter of Intent (LOI) template. An LOI outlines the terms & agreements of a transaction before the final documents are signed. The main points that are typically included in a letter of intent include: transaction overview and structure, timeline, due diligence, confidentiality, exclusivity includes an acquisition of all the assets of ABC and some other operating assets by DEF for the sum of $6 million. 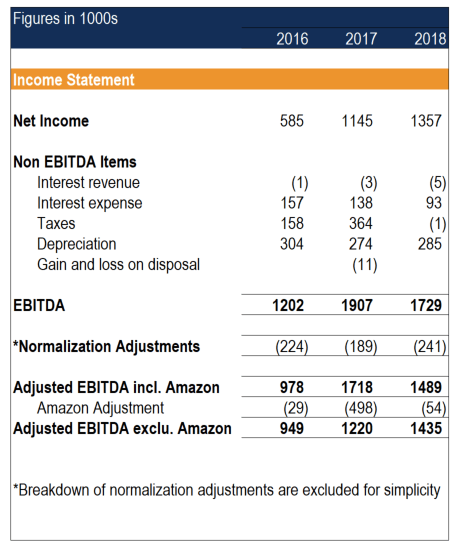 The $6 million represents a 4.23x multiple on EBITDA before adjustments for Amazon-related revenue (a large non-recurring revenue source that appeared when they moved to their Buffalo, NY office over a three-year period), the multiple is 4.39x adjusted EBITDA. Revenue and Amazon ABC normally has a few larger projects that occur each year. However , in in 2017 , ABC was awarded a contract by Amazon that was much larger than normal. Although the Amazon project was unusual due to its size, ABC may be able to take advantage of future one-time large orders as they are now on the supplier list for Amazon. XYZ Capital Partners should follow s Amazon’s Vancouver development closely as it may be able to pick up additional large orders. QRS reviewed revenues for 2017 to determine if any large one-time revenues were incurred similar to Amazon. QRS noted that there were no large revenue increases and all customers in the top 10 reported revenues for at least two 2 consecutive years. 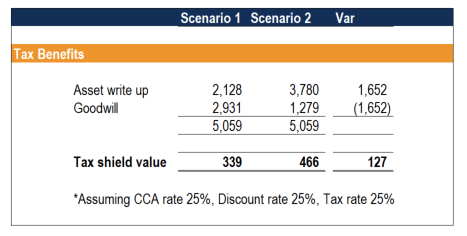 Purchase price allocation XYZ should allocate as much of the purchase price as possible to tangible assets in order to take advantage of a faster write - off of those assets for tax purposes. QRS estimates that the value of the tax shield to Pender West would increase by $100,800 if an additional $1.26 million of value were allocated to tangible assets. XYZ should determine the real fair market value for the assets to be purchased and see if it can negotiate any further value to be allocated to the tangible assets in order to increase the tax shield created through this transaction. In 2017, ABC saw a large spike in revenue due to the Amazon project; Amazon needed assistance in expanding into their Buffalo office. 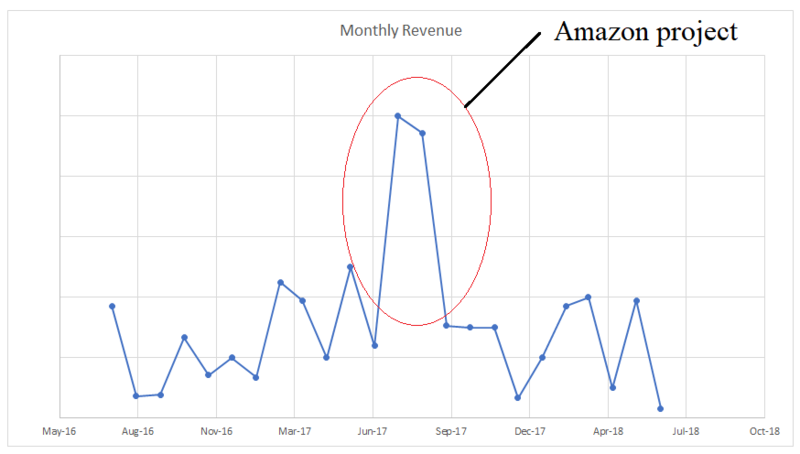 Excluding Amazon, revenues increased by $195,000, or 26%, in 2017 and $153,000, or 14%, in 2018. A was the largest customer, generating revenue of $135,000, or 12%, of total revenues in 2018. 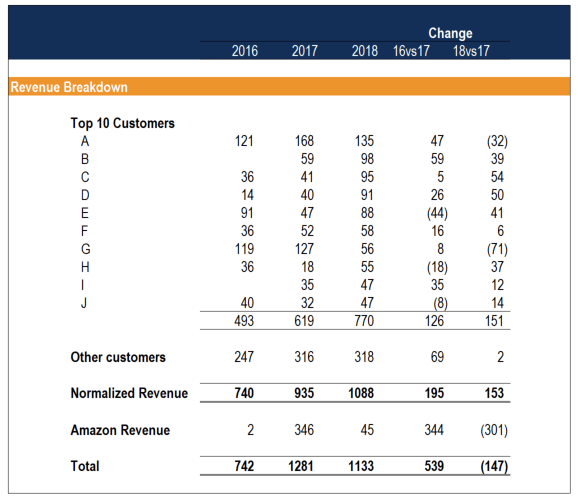 QRS reviewed revenues for 2018 to determine if any large, one-time revenues occurred, similar to the revenues from Amazon in 2017, that would require a higher than normal amount of adjustments. QRS noted that there were no large revenue increases and that all customers in the top 10 as of 2018 had provided consistent revenues for ABC for at least 2 consecutive years. Under this proposal, ABC would be able to write up the assets purchased by $1 million from their original capital cost of $389,000. This would leave an additional $3 million in goodwill for which no tax cost base will be created. XYZ should determine the real fair market value for the assets to be purchased and see if it can negotiate any further value to be allocated to the tangible assets in order to increase the tax shield created through this transaction. The above example is merely an executive overview of how a quality of earnings review is conducted and the type of financial statement analysis involved. Other possible issues and recommendations an external auditor may bring up include normalizing earnings, addressing payroll inefficiencies, or implementing a new IT system. Notice the important issues here. In 2017, a large proportion of ABC’s net income came from a single large order from Amazon. Without a quality of earnings report, ABC’s value could appear greatly inflated. Many acquisition transactions fail during the due diligence process as the reviews highlight the key failings of a target company that would not have been discovered without an external audit. Consulting services are of critical importance because they also provide recommendations on how to hedge potential business risks and take advantage of potential gains (such as tax benefits). Note that this assessment is purely recommendation-based. The recommendations in a quality of earnings report constitute professional analysis and advice but are not required to be followed by either the acquirer or the target company.